Produktinformationen "Naruto - Gaara HQS / " A father's hope, a mother's love": Tsume"
WICHTIG, bitte vor dem Kauf lesen!!! Bei dieser HQS Statue ist eine Anzahlung von 150,-€ inerhalb von 7 Tagen ab dem Bestelldatum erforderlich, da auch wir innerhalb der Frist Tsume eine Anzahlung leisten müssen! After progressing and gaining experience for 8 years, TSUME is going back to its roots by offering a new interpretation of the first character that was adapted in HQS by TSUME: Gaara. Last year, three concepts were submitted to the public's vote. Feelings and passion won over and it is the vision of Gaara protected by the image in sand of its mother which prevailed. From the moment he was born, Gaara was sentenced by his father to become a weapon for his village, hosting the powers of the Ichibi in his body. This caused the death of his mother and slowly drew a wall of solitude around him. We are happy today to present this new version of Gaara. A symbolic statue that represents both the hopes of a father and the love of a mother. Sand sculpture has always been tricky. In order to get as close as possible to the desired texture, real sand was added to the statue. The HQS by TSUME also comes with two bodies for Gaara, one more solemn, the other more dynamic, to let you choose the position that suits you best. A very discreet shading work was done on Karura's face to keep the shades of the sand while bringing depth to the statue. The burgundy and gray outfit of Gaara stands out against an ocher background that frames the character. We wanted to make a statue that shows the evolution and passion of TSUME for its work. It's a mission accomplished.. Scale 1/8. Total run of 1800 pieces. 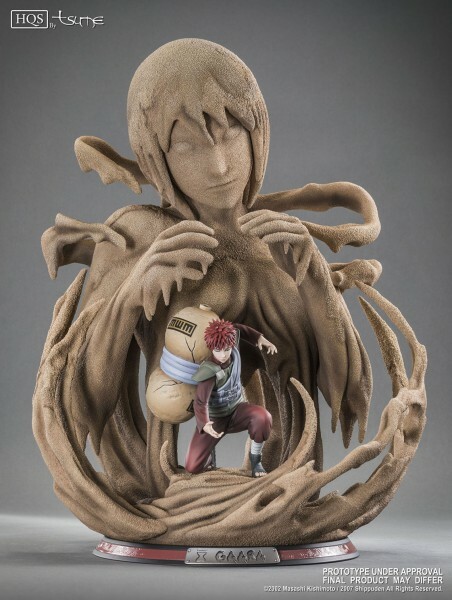 Weiterführende Links zu "Naruto - Gaara HQS / " A father's hope, a mother's love": Tsume"
Kundenbewertungen für "Naruto - Gaara HQS / " A father's hope, a mother's love": Tsume"